We can always find a “good” reason to not do something. 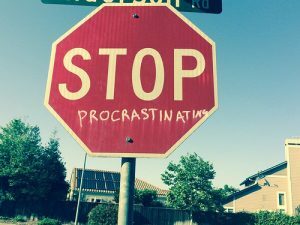 This procrastination happens because we have some sort of resistance to doing that thing – and often this resistance is happening at a non-conscious level, outside of our awareness. If we don’t explore consciousness and uncover and then let go of the resistance, we will keep procrastinating. An easy way to do this is to simply ask yourself, “Based on my resistance and procrastination, what must I believe?” Then sit quietly and usually an answer shows up.